but have not yet seen. Soon, soon. One of you tried and faltered. And later in the day, tried again. And sighed and said to yourself another day. Maybe there is a need to hurry or maybe not. I could be talking of the hare and the turtle or not. And coffins versus urns versus boats sent out to sea aflame. what they had always seen. not unlike swans bend their necks. They are of the spring, their turmeric innards tease. Kelly R. Samuels lives in the upper Midwest. 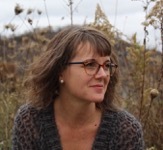 Her poetry has been nominated for Best of the Net, and has appeared or is forthcoming in numerous journals including The Carolina Quarterly, Rappahannock Review, Sweet Tree Review, Salt Hill, Heron Tree, and RHINO. She has two chapbooks forthcoming in early 2019 – one from Unsolicited Press and one from Finishing Line Press. Posted on October 23, 2018 by Dini Karasik.